When we were growing up, my mom would make pasta salads for us as a light dinner. She recently reminded me of the special ingredient in the dressing that I was leaving out. Horseradish. I made it again, using horseradish this time, and it made all the difference in the world. You can use any combination of vegetables you like in this. Cook orzo in boiling water for nine minutes. Drain and rinse in cold water to stop cooking. In a small bowl, mix together mayonnaise, horseradish, lemon juice and salt. 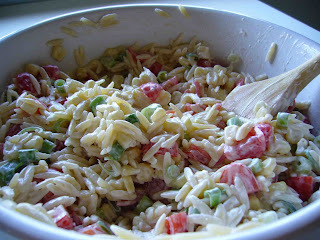 Add dressing, scallions, corn and tomatoes to orzo and mix well. Chill for an hour before serving.